Following on from the successful and highly-engaging exploratory workshop held in September 2016, this August saw the second meeting towards the production of a new ‘Routledge Guide to Using Historical Sources’ aiming to offer an accessible introduction to the sources and methodologies of spatial history. This report will explore the different ways in which this proactive workshop helped to bring the volume closer to becoming a reality. Dinner, the evening before work truly began, partly offered a social welcome to participants, some who had merely walked across town from the School of History in St Katharine’s Lodge, but several of whom had travelled to St Andrews via Edinburgh Airport from locations as far afield as Buffalo, USA. However, conversation turned almost immediately to the volume. Draft chapters had been circulated in advance via Dropbox, and many a greeting could be heard along the lines of “ah, so you’re so-and-so, I very much enjoyed your paper on such-and-such, and it made me think of…” This cross-dinner table discussion typified the collaborative, conversational tone of the following two days. The initial workshop last September focussed on the sharing of preliminary ideas between a relatively small group of spatial scholars. The workshop this August saw not only the addition of new potential contributors to the volume – of whom more shortly – but also the welcome input of several external commentators. These scholars, all experts in their field, not only provided feedback on individual papers, but also offered their own perspectives on what space is, and what a historical introduction to spatial history as a subject should try to do. SUSANNE RAU (Universität Erfurt), having quite literally written the book on space (Räume: Konzepte, Wahrehmungen, Nutzungen, 2013), helped to ground the conference in just these challenging questions. Whilst she challenged whether it is possible – or even useful – to attempt to define space, she emphasised that historians have the potential to ‘add value’ to discussions of the past through a consideration of how space is ‘produced’ (a process which can also be destructive), how our social relations are transformed and institutionalised through space, and the ways in which we can analyse the power relations behind the claims made to spaces through documents such as maps. CHRISTOPH NÜBEL (Humboldt-Universität zu Berlin) picked up this latter theme, pointing out that several papers shared the common theme of the appropriation of space, whether through economic activities or even in the construction of historical narratives. DIARMID FINNEGAN (Queen’s University Belfast) provided an interdisciplinary insight, suggesting that the fields of geography and spatial history have more in common than might be assumed at first glance in terms of the problems posed and the answers provided. He acknowledged, however, the value of ‘spatial history’ as a designator which brings together the figures of both space and time as categories for analysis. As noted above, the number of participants grew significantly between the September and the August workshops. 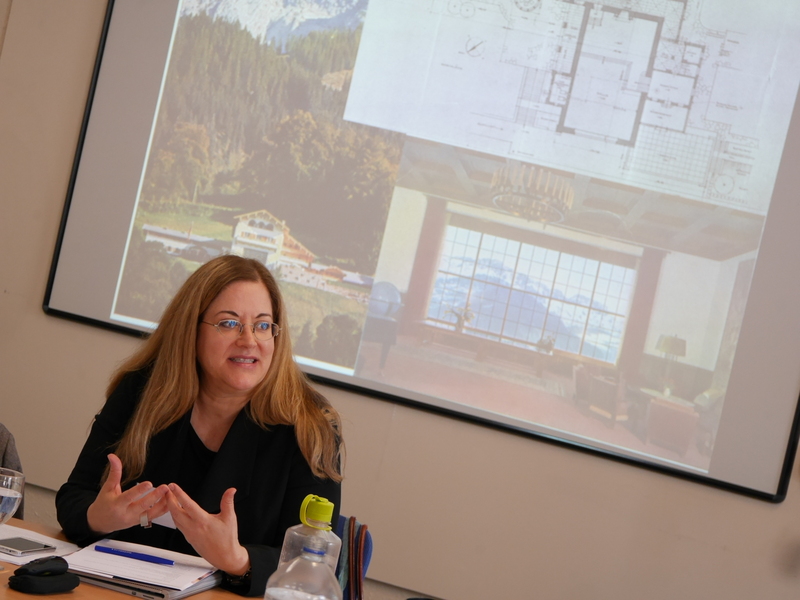 DESPINA STRATIGAKOS (University of Buffalo) provided a fascinating exploration of Hitler’s domestic spaces, utilising the floorplans (both ‘real’ and unrealised) for the Berghof, the dictator’s home in the Bavarian Alps. She brought the eyes of an architectural historian to bear on the question of how Hitler constructed and displayed this home space in the service of developing his image as a refined, educated world-leader. Moving from the small scale of the floorplan to the national or even transnational scale of railway networks, FRITHJOF BENJAMIN SCHENK (Universität Basel) offered a consideration of – and indeed a proposed revision to – the history of infrastructure. He emphasised that traditional narratives suggest that, by enabling people to cross vast distances in relatively little time, developments such as trains served to integrate large territories such as Tsarist Russia. Schenck suggested that, by contrast, trains stratified society further, for example in physically separating socio-economic classes into different carriages, and by enabling greater population movement and correspondingly less national stability. ANTONIS HADJIKYRIACOU (Boğaziçi University) explored both the promise and the pitfalls in utilising GIS to visualise historic economic data, focusing on the example of the 1572 fiscal survey of Cyprus. In common with TIM COLE (University of Bristol), who had attended the September workshop, and his new co-author ALBERTO GIORDANO (Texas State University), Hadjikyriacou emphasised the need to carefully interpret and curate data before inputting it into GIS, and the nature of visualisations as important analytical tools for the historian to build their work upon, rather than as straightforward ‘illustrations’ of results. STÉPHANE VAN DAMME (European University Institute) and KATE FERRIS both brought questions of space to distinctive historical sub-disciplines: the urban history of science and the history of everyday spaces, respectively. Van Damme set out a historiographical narrative of the impact of the spatial turn upon the history of science and the metropolis, before considering the roles of ‘space’ and ‘place’ within the Scientific Revolution. Ferris took the discussion from telescopes to pint glasses with a case-study of bars in Fascist Italy, highlighting the ways in which they served as complex political spaces in which individuals might both express divergent views, and also suffer the regulation or observation of the regime. 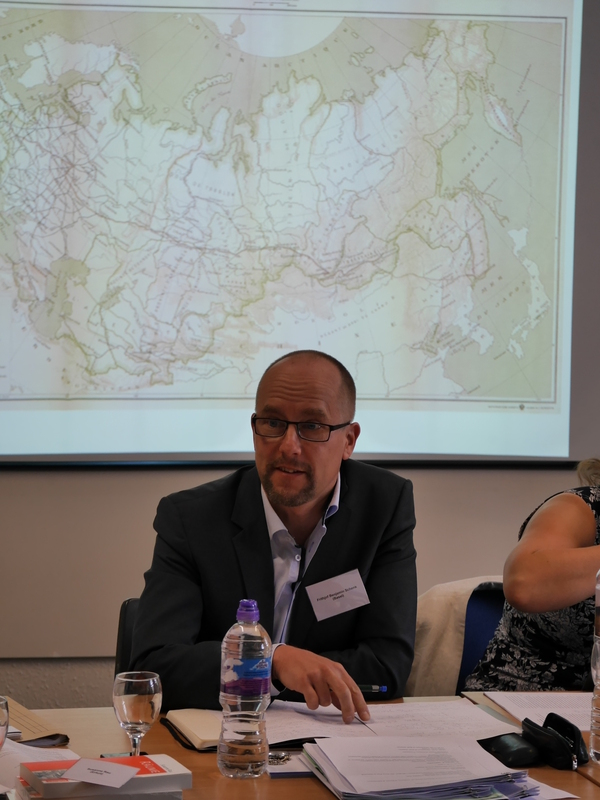 The final new contribution, from ADAM CATHCART (University of Leeds), discussed the similarly ambivalent space of borderlands, with a focus on the Sino-Korean borderlands from 1931-1954. Cathcart emphasised the disjuncture between the reality of borders as sites which limit movement, and the focus – in both scholarship and popular fantasy – on movement across them. In terms of attendees of the original workshop, BERNHARD STRUCK offered a more detailed analysis of German maps as ‘spatial text’, whilst JAMES KORANYI (Durham University) re-analysed travel guides as constructing mental, national space, and JORDAN GIRARDIN reminded us – in absentia, and via an excellent Youtube video – that travel accounts should be read ‘from a to z’, with attention to the traveller as an ever-moving space. 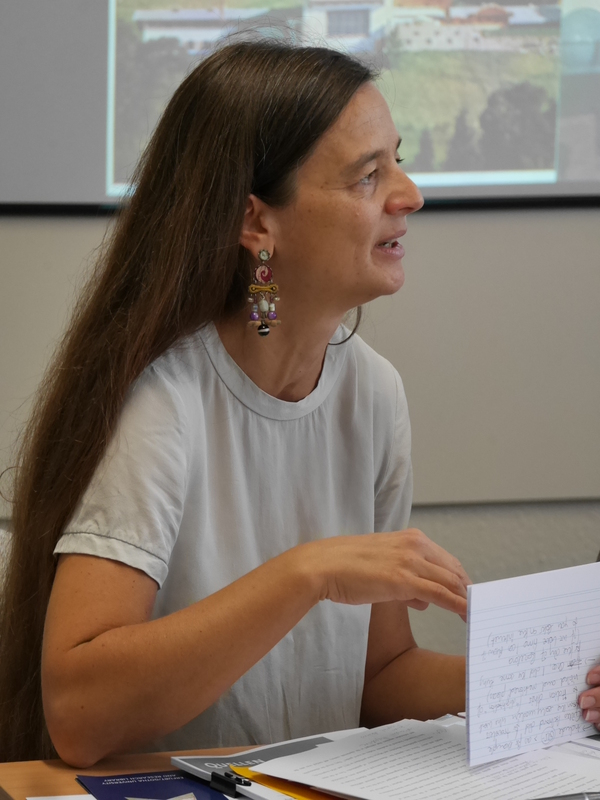 MICHAEL TALBOT (University of Greenwich) returned to the ‘big blue wet’ problem of maritoriality, MARK HARRIS took the workshop back down the Amazon, and DAWN HOLLIS once more forced the spatial theorist Henri Lefebvre up a mountain. Finally, SARAH EASTERBY-SMITH and MATT YLITALO brought Michel Foucault’s concept of ‘heterotopia’ to bear on nineteenth-century whaling vessels as particularly complex and fluid spaces. (For more details on the initial ideas underlying all of these contributions, please see the previous workshop report). Of course, from the perspective of participants at the two-day workshop, much of the above ‘discussion’ occurred between the pages of pre-circulated papers, with the bulk of the time together given over to in-depth discussion both of individual papers and of the volume as a whole. One participant lauded the ‘extraordinary process’ which this enabled, with the group returning again and again to questions of volume structure and how each chapter might meet the needs of our intended student reader until a general consensus was reached. A particularly important discussion centred upon the question of inviting further contributions to the volume, with the communal wish-list for further areas of spatial history that could be covered reaching lengths that would exceed the page count of two or three volumes, let alone one. Several participants advocated passionately for a chapter focussing particularly on space and gender, whilst others argued that questions of gender and diversity more generally ought to be represented in as many papers as possible. The editors ultimately decided to follow both courses of action, and went away with a list of suggested authors to add further thematic range to an already broad volume. The phrase ‘the editors decided’ is not, however, the note to end this report on, for what should really be emphasised about the workshop was its interactive, collaborative nature, with editors and contributors alike working to bring the intended volume another few steps closer to fruition. Pre-circulated papers, open discussion and debate, and above all a good meal all served to make the workshop an invigorating process for all involved and, most importantly, an effective stage in the long journey of producing an edited volume.